Fathom Films has over 30 years of experience in marine and underwater photography. Our video and film work has appeared on all the major networks over the years. 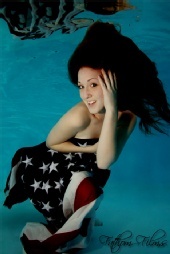 Recently we have had an increasing demand for underwater glamour for print work. Our clients are always looking for new faces to advertise their products in an underwater setting. We have a full complement of digital and 35mm underwater still cameras, and super 16mm and 35mm underwater motion picture cameras. We also have the latest digital HD video cameras and a full HD editing suite in-house. Our video and film work has appeared on ABC, Animal Planet, BBC, CBS, CNN, Discovery Channel, E!, Fox, History Channel, MTV, NBC, Outdoor Channel, PBS, Telmundo, TBS, Travel Channel, VH1, and Univision. Our print work has appeared in: Adventure Sports, Aquarium, American Photographer, Boating, Boating Life, California Diving News, Cosmopolitan, Dive Girl, Diver Magazine, Diver Magazine (Japan), Entrepreneur, Fitness, Glamour, Maxim, Men’s Fitness, Motorboating and Sailing, National Geographic, Pacific Diver, PC Magazine, PC World, People, Popular Photography, Rondales Scuba Diver, Rolling Stone, Shape, Skin Diver Magazine, Sportdiving Magazine, and Surfer, just to name a few. GREAT WORK!! Please need me for something and then make me a mermaid!! I swear, I swim just like one!!!!!!!!!! Amazing work! i LOVE it ALL!!! I would love to work with you. I currently live in Bermuda and looking for international work. Let me know if you have any interest in my look. :)Keep up the Great work! THIS IS SOOOOO COOL! LOVE THE CREATIVITY!!! !